← Happy 40th Anniversary, Sydney Opera House! To check out more rocks, roll on over to Ailsa’s Travel Theme, y’all! This entry was posted in Ailsa’s Travel Theme, Japan, Kyoto, Photography, Stephen Kelly Photography, Tokyo, Travel, Travel Theme and tagged Ailsa's Travel Theme, Japan, Kyoto, Photography, Stephen Kelly Photography, Stone, Tokyo. Bookmark the permalink. That’s an interesting first shot with the caps and bibs. What’s it all about? Hi Honie … and thanks for stopping by. Dunno, but it was not uncommon to see bibs on lots of statues in Japan. The caps … not so much. Maybe some of my Japanese blog friends out there can fill us in on what they signify. Great collection. Put altogether, I feel like these pictures tell us something about the Japanese culture, though I don’t know exactly what. Hi Juliann … and thanks for stopping by. I know exactly what you mean. You see this type of thing all over Japan, so I know it all signifies something, but I have no idea what that might be. It was interesting to look at this collection of stone statues. Hi Colline. Cool … glad you liked it. HI Indra. Thanks for the kind comment, and for dropping by my blog. That’s quite a gallery, Stephen :D. I am also interested to find out about bibs and caps :D.
thanks paula! i, too, am curious about the bibs and caps. quick … to the research lab! amused by the last photo! HI Frizz … yah, that’s one of my faves too. There is a showing of humor here like the photo of the monkey with red hat and top, and the bottom panel of the hear no evil, see no evil, speak no evil. Hi Angleline … you’re right. Many of these types of sculpture had a slightly humorous element to them, although many were somber and serious. A most eclectic collage of stone figurines (and bibs!). hi mrscarmichael! it seems like people are really into the bibs. i guess you never know when a barbecued spare rib feast might break out! Great selections, Stephen! Each presents something different. Hi Amy! Thanks for the nice comments. Sometimes I think people view Japanese traditional sculptures as being very serious and devout, but I wanted to show of them can be fun and light-hearted too. Thanks, Sylvia! Glad you liked … this was a fun challenge. I love those cute baby(?) 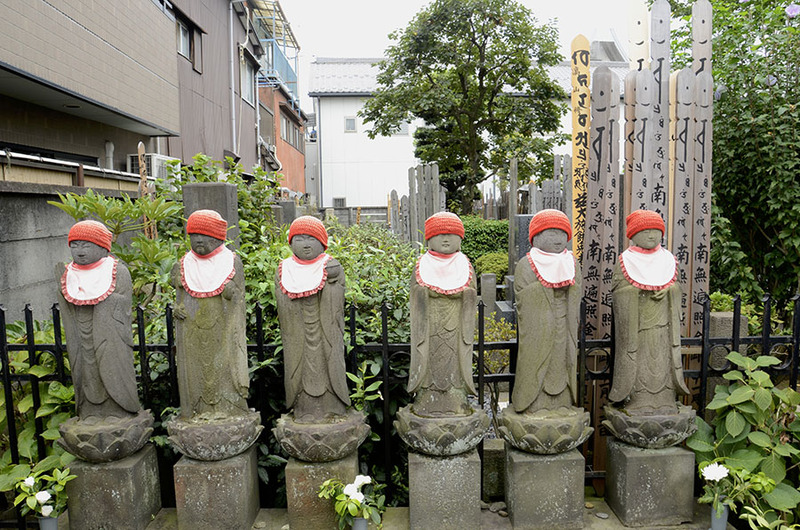 statues with bibs and orange caps. It seems like everyone likes them. I’m trying to get to the bottom of what the caps and bibs signify, if anything. Hi Janet! Gald you liked them … and thanks for visiting!